Address : 29 Petchakasem Road, Hua-Hin, Prachuabkirikhan 77110 Thailand. By car: The journey from Bangkok to the hotel takes less than 3 hours. 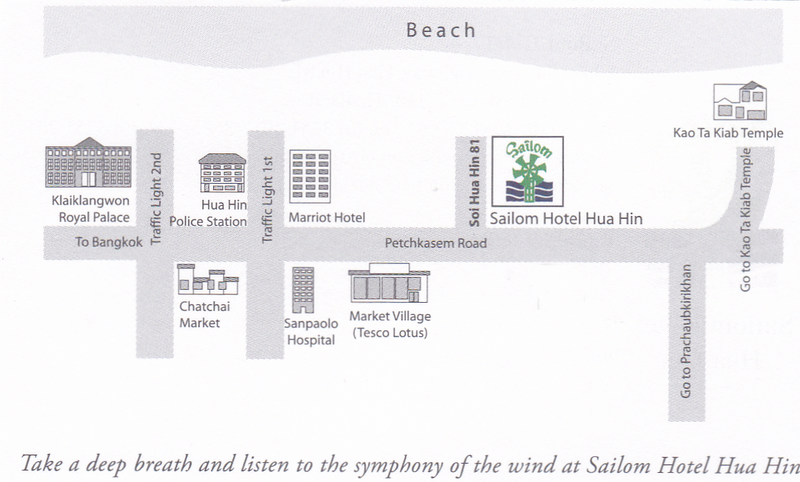 Drive your car from Bangkok down south to Prachuabkhirikhan on Phetchkasem Road -> to Cha-am -> to Hua Hin. By air: Hua Hin Bangkok Air Shuttle operates 4 flights a day from Bangkok to Hua Hin Airport (see schedule below). Flying time is approx. 35 minutes. By public transport: Take a bus from Southern Bus Terminal (Khon Song Sai Tai) to Hua Hin, which operates by Transport Co., Ltd. The fare is approx. Baht.